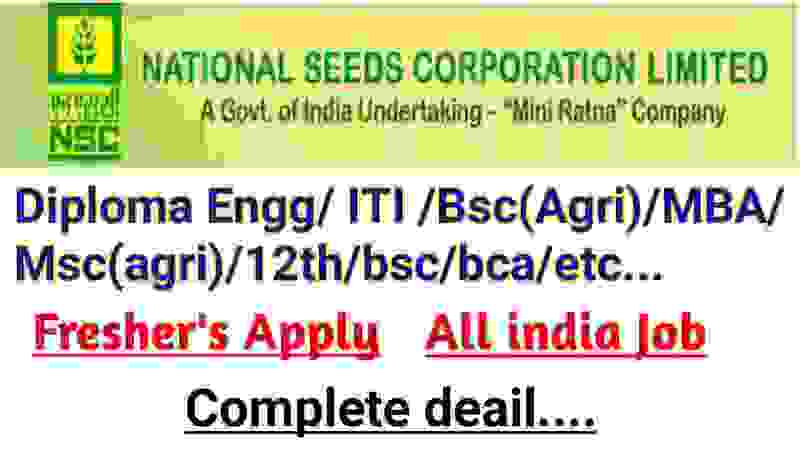 National Seeds Department recruitment for Manager and Management Trainees posts 2019. Online applications are invited from all well qualified fresher candidates for these Government jobs in India. The process for applying online for these various job profile is currently active and you can apply online up to 9th Feb. 2019. 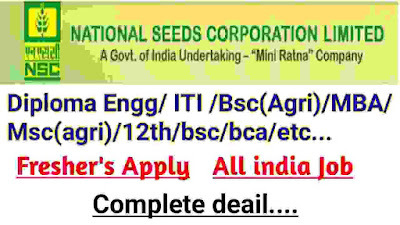 National Seeds Corporation Limited under the administrative control of Ministry of Agriculture & Farmers Welfare, Department of Agriculture Cooperation & Farmers Welfare is an apex body engaged in production of quality seeds and distribution, invites online application from Indian Nationals for filling up the following posts on direct recruitment basis at Corporate Office (New Delhi), Regional I Area Offices and Farms (located all over India). More information related to this India Seeds recruitment process is given below in this job posting or you can also check out the official PDF file which also contains the full information related to these jobs. B.Sc. (Agriculture), MBA/ M.Sc./B.E./B.Tech. (Agri. Engg.) (Civil)/CA/CS. Must have applicants age less than 27 years for applying these job profiles. MBA (Agri. Business Management)/B.Sc. (Agri). 3 years diploma in one of the following stream: “Civil/Agri./Electrical Engineering”. ITI certificate in trade of Fitter. 12th in Agriculture stream can apply. Applicants who have a Degree in Law are eligible to apply for these job profiles. Paying Method: Eligible and interested candidates have to pay the application fee only through online methods:” Credit Cards/Debit Cards/Net-banking” for the payment of the above application fee for this India Seeds recruitment process 2019. Those applicants who satisfied all the term and conditions which we explained above in this job posting article can apply online for this India Seeds recruitment 2019. The procedure for applying online is currently active from 19th Feb. 2019 and the process remain activated up to 9th Feb. 2019. So all eligible candidates need to visit the official website of India Seeds department for applying this recruitment process. We also shared the IMPORTANT LINK at the last of this article. 9th Feb. 2019 is the Last Date to apply.